The USDA's National Agriculture Statistics Service released their 2018 estimate of farmland values on August 2 and farmland values have held up well in spite of the very large drops in farm income. Their estimates showed slight increases in cropland values for most areas of the country. On average cropland values have been relatively flat since 2014, when farm income started its contraction. Purdue University also recently released their estimates of Indiana farmland values. Like USDA, Purdue also showed slight increases for 2018. The annual percentage changes for average quality Indiana farmland are shown in Figure 1. For 2018, they estimate that land values have increased 2.4%. Since their peak of $7,976 in 2014 average quality farmland values have declined a total of 11%, with the declines coming in 2015 and 2016. Figure 1. 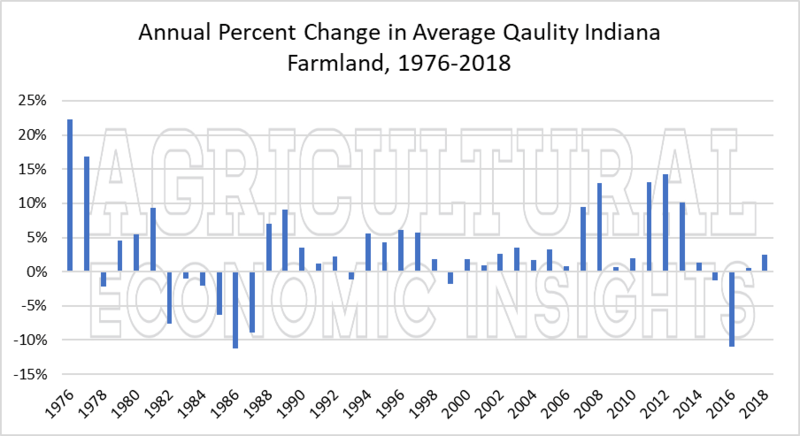 Annual Percentage Change in Average Quality Indiana Farmland, 1976-2018. We have discussed cash rents on numerous occasions (see the farmland section) and wondered whether rents could continue to hold up in the face of declining farm incomes. Here, we will examine the proportion of the gross revenue generated being paid in rent. 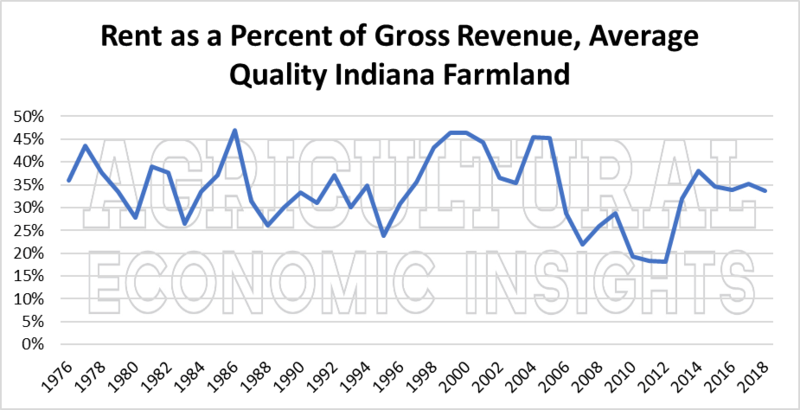 The ratio of cash rent to gross revenue on average quality Indiana farmland is shown in Figure 2. For instance, a value of 40% would mean that 40% of the gross revenue was paid as cash rent, with the remaining 60% left to pay all of the other expenses of farm production. This ratio can be quite volatile because gross revenues can vary widely from year to year. Since 1976 the ratio has moved in a range from 18% to 46%. This volatility makes it a little difficult to interpret the ratio, but some general comments are certainly possible. Figure 2. Ratio of Rent to Gross Revenue, Average Quality Indiana Farmland 1976-2018. From 2014 to 2018, the rent to gross revenue ratio has been near 35%. So is this ratio currently high, low, or somewhere in between? Looking back, there were several years in the late 1990's and early 2000's when the ratio was higher than today. However, it is important to remember that the government farm programs were making substantial payments at that time and those payments were not included in our estimate of gross revenues. If added, they would certainly drop the ratio from that time period substantially. With 35% of revenue going to rent, the remaining 65% of revenue must pay the variable costs of production, fund capital equipment replacement, pay labor, and provide for family living expenses. It seems unlikely that there is much room for this ratio to sustainably rise further. Increases would certainly result in even greater economic losses for farm operators. This would suggest that until gross revenues grow or other costs decline, there is little room for farmland rents (and returns to farmland) to grow. Another factor that drives farmland value is the amount that buyers pay for future earnings. This is often proxied by the cash rent multiple, or it's inverse the capitalization rate. We will use the capitalization rate (calculated as cash rent divided by farmland value) here. Despite the 11% decline from in cash rents since 2014, the capitalization rate for Indiana farmland remains relatively low (Figure 2). In other words, values remain high relative to income. The capitalization rate has been below 3.5% since 2011. Since 2013 it has basically been a few basis points above or below 3%. At this point, it appears that the long trend of ever lower capitalization rates has ended or at least paused, but capitalization rates remain very low by historical standards. Figure 3. Ratio of Cash Rent to Farmland Values or Capitalization Rate, Average Quality Indiana Farmland, 1976-2018. The most recent data on farmland values suggest a stable market. This is despite a substantial drop in farm incomes. The large increases in land values of a few years ago were primarily driven by two factors, increasing farm income and falling capitalization rates. Today, income has fallen substantially. Still, farmland values have remained relatively high as cash rents have been stubborn to adjust lower. 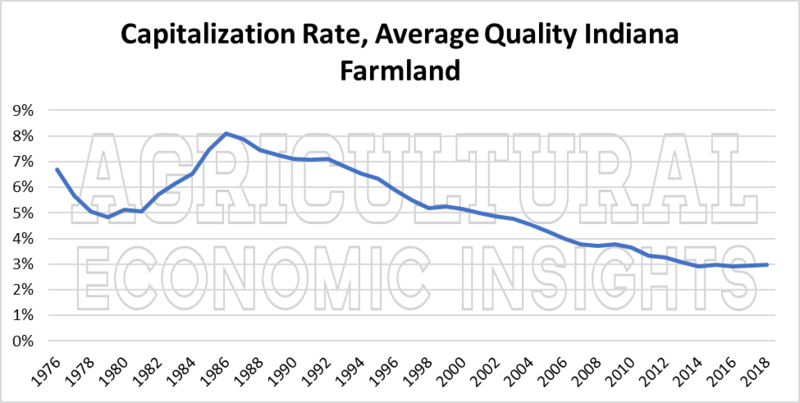 Additionally, the capitalization rate on farmland remains very low. When looking at the data it appears that both of the key drivers that impact farmland values are stuck in neutral to reverse. Until farm revenues begin to grow or other costs decline, it is difficult to see how cash rents will increase. Likewise, with interest rates starting to rise, it seems unlikely that capitalization rates will fall much further. Given these two factors, it will be difficult for farmland values to resume much of an upward climb and they will likely experience some downward pressure. In short, it seems difficult to make a strong case for higher farmland values at this point.